PUCCH is an uplink physical channel that carries UCI (Uplink Control Information). As DCI (Downlink Control Information) is carried by PDCCH, UCI is carried by PUCCH. A big difference between DCI and UCI is that UCI can be carried either by PUCCH or PUSCH depending on situation whereas DCI can be carried only by PDCCH (not by PDSCH in any case). How to Determine PUCCH location ? 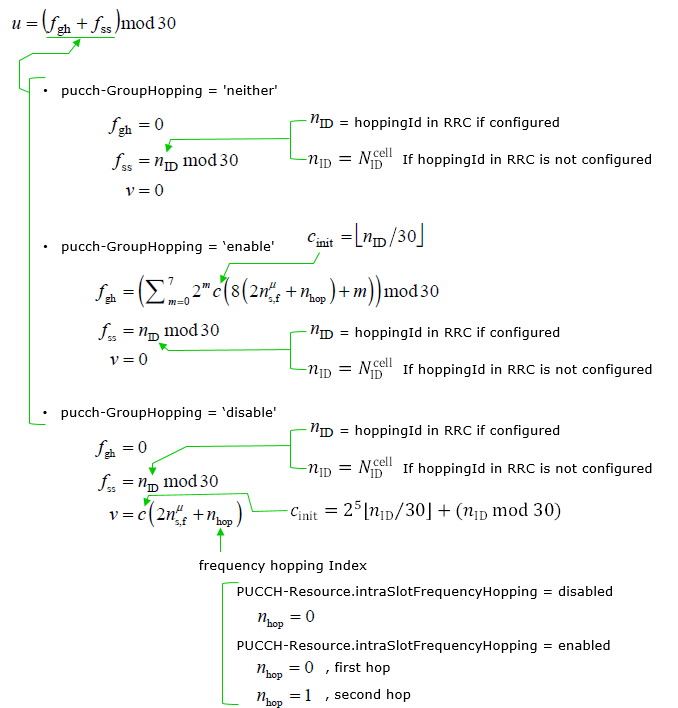 How to define PUCCH baseband signal ? What is PUCCH Resource and what constitues it ? How does UE figure out which resource to apply ? How the PUCCH Resource table is defined ? The contents of UCI is as follows (this is same as LTE). Not all of these are carried by single UCI. Depending on situation, sometimes only CSI is carried, sometimes ACK/NACK only, sometimes SR only and sometimes CSI & ACK/NACK etc. 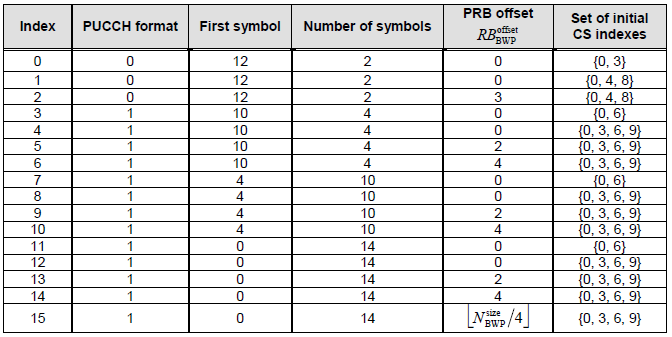 There are 5 different formats of PUCCH and which one of them is used is determined by how many bits of information should be carried and how many symbols are assigned, as summarized in the following table. with UE multiplexing in the same PRB. with multiplexing in the same PRB. with no multiplexing in the same PRB. with moderate UCI payloads and with some multiplexing capacity in the same PRB. I think the description from 38.300 - 5.3.3 would give you another aspects of the description as below. The short PUCCH format of up to two UCI bits is based on sequence selection, while the short PUCCH format of more than two UCI bits frequency multiplexes UCI and DMRS. The long PUCCH formats time-multiplex the UCI and DMRS. Frequency hopping is supported for long PUCCH formats and for short PUCCH formats of duration of 2 symbols. Long PUCCH formats can be repeated over multiple slots. 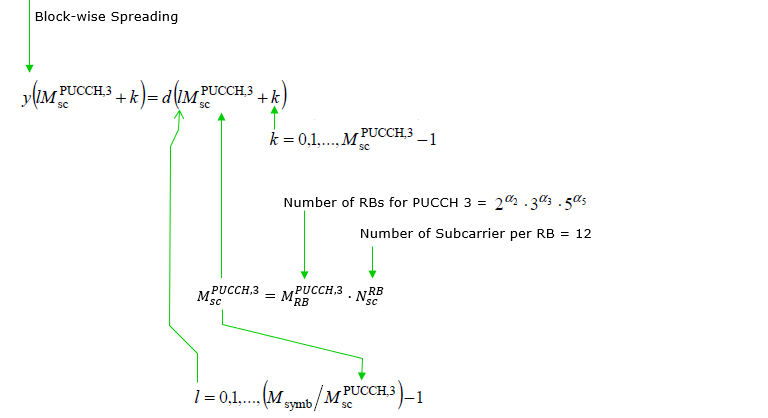 Following is the summary of PUCCH formats with more detailed parameter. For the overview of PUCCH parameters, I think this table would be enough but if you want to know of the detailed meaning of each of these parameters, you would need to go through the whole page. 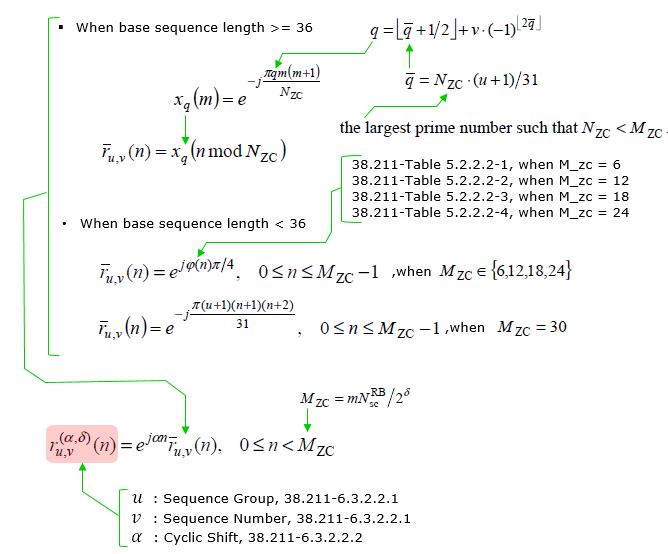 Following is the illustration for the description on 38.213 - 9.2.1 PUCCH Resource Sets. As you see in the following illustration, some parameters applies to all PUCCH format but some parameters applies to only specific formats as below. number of PRBs : Applies to only PUCCH format 2 and 3 (See PUCCH-format2, PUCCH-format3 in RRC) . As in LTE PUCCH(format 1,1a,1b, format 2,2a,2b and format 3), the baseband generation process for NR PUCCH is also very complicated. As you know, all the purpose of PUCCH is just to send a few bits to gNB. I've been thinking on why we need this kind of complicated way just to send a few bits. Actually PUCCH is not the only one that is designed in such a complicated way. Every channel processing in cellular technology is complicated. Main reason behind this complexity is for reliability of the delivery of the contents and for some channels we put some additional complication for handling multiple users with very limited physical resources. Anyway, I don't think I can explain fully about the design concept of PUCCH baseband generation in plain words and I don't want to pretend that I myself knows about the full detail. Full understanding on this process will be required only for a few physical layer development engineer and those engineer would not need this type of notes since they've already had bettern knowledge than I just by reading 3GPP documents. 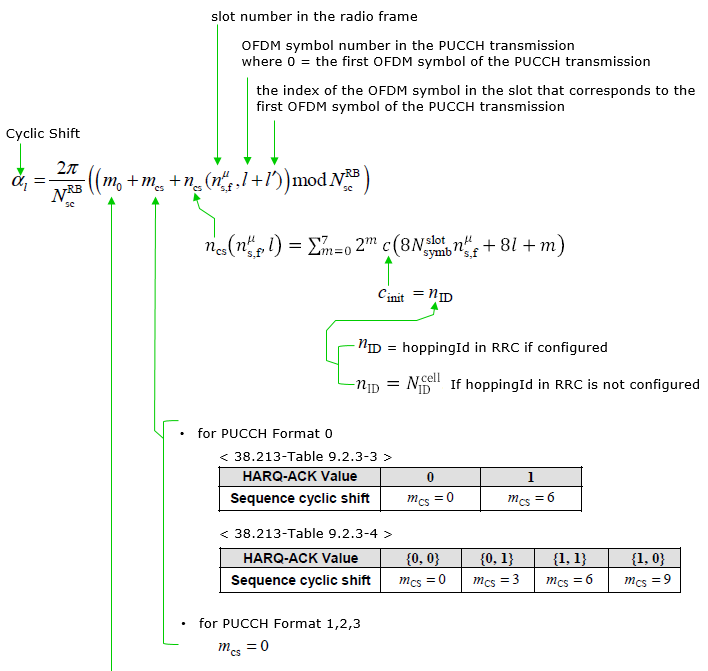 The main purpose of writing this note is to make a cheat sheet for overall PUCCH baseband process and figure out the link between RRC parameter and baseband process. 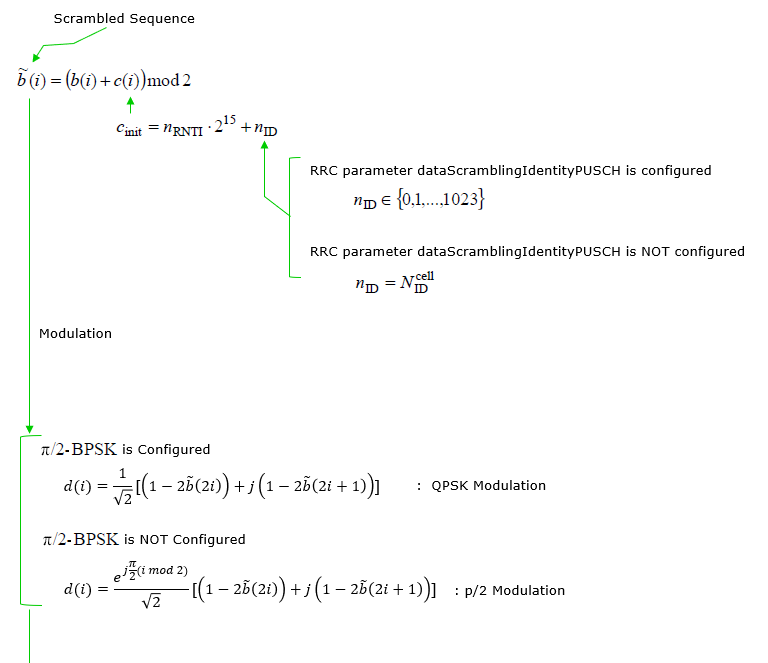 Even if I don't completely understand the process, at least I can say 'Hmm... this RRC parameter seems to be related to this part of the baseband process'. This three steps applies to all PUCCH formats (Format 0,1,2,3,4) but depending on PUCCH format a little different parameters(see here) are used during this process and some format would require some extra steps in addition to this common part. 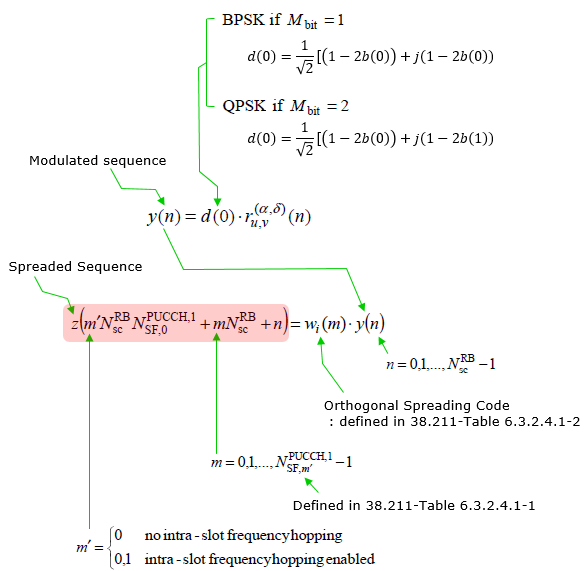 QPSK or BPSK is used depending on cases as below. Various types of Channel coding is applied to UCI(Uplink Control Information) depending on the number of bits to be carried. In all other cases UCI is multiplexed by rate matching PUSCH. As described above, there are various parameters to define a specific PUCCH. The set of parameters for defining a specific PUCCH is called 'PUCCH Resource'. The list of parameters that are used to define a PUCCH Resource are as follows. Not every PUCCH format uses all of these parameters. Depending on PUCCH format, a PUCCH uses different set of parameters. Following table shows which parameter is used for which PUCCH format. In previous section, we learned a lot of parameters are involved in defining a specific PUCCH. Then how the gNB transfer those information to UE ? In other words, how UE can figure out what kind of pucch format and parameters should be used for at the specific moment of PUCCH transmission ? There are two different ways of defining PUCCH Resource List(Table). One is to use the table predefined in 3GPP specification and the other one is to arbitrarily defined table using RRC message. This case is used in a specific case as stated below (38.213-9.2.1). 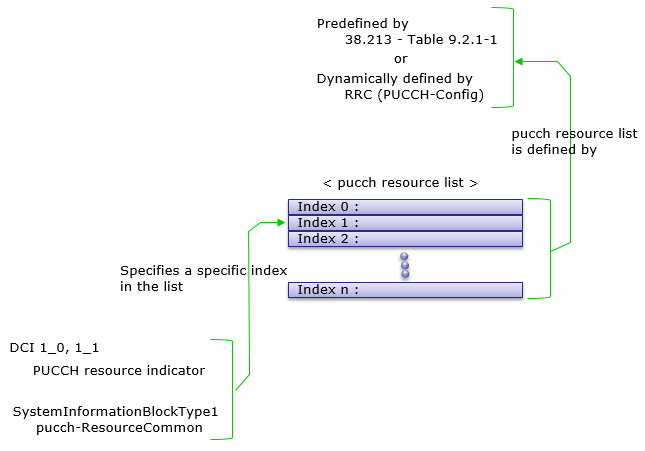 It means that this table is used when there is no PUCCHResourceSet defined in PUCCH-Config in RRC. There are two RRC messages that would carry PUCCH-Config. One is RRCSetup and the other one is RRCReconfiguration in case of SA or RRCConnectionReconfiguration in case of NSA. So if PUCCH-Config is configured in RRCSetup, this table is used for only a few steps before RRCSetup message. If PUCCH-Config is not configured in RRCSetup, this table is used for pretty long time until the rrc procedure reaches RRCReconfiguration. When this table is used, only one of these items (resource) can be used for a specific cell and the specific resource to be used for the cell is configured by PUCCH-ConfigCommon.pucch-ResourceCommon in SIB1 as shown below. As you see, pucch-ResourceCommon can specify a number between 0 and 15 which indicate the table Index in 38.213 Table 9.2.1-1. 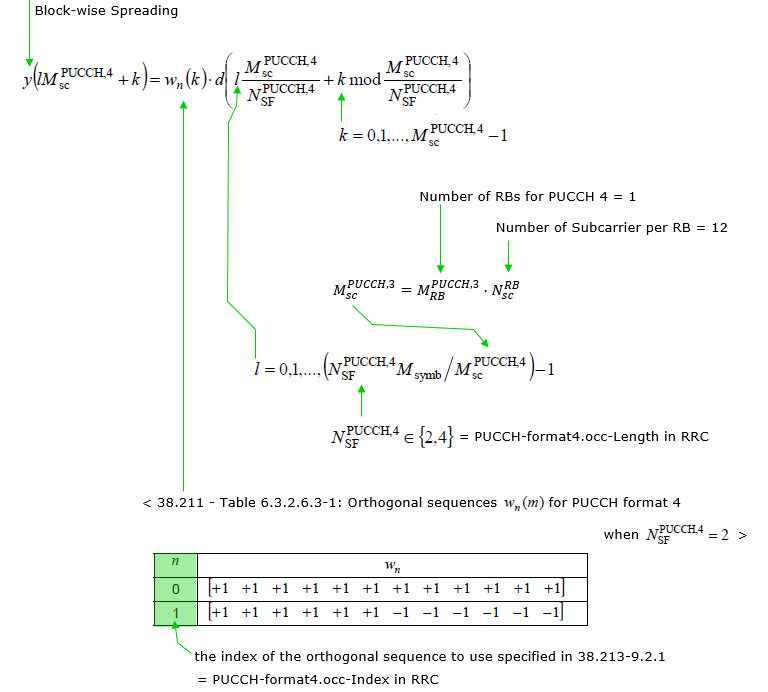 PUCCH Resource table is defined in RRC message(e.g, RRCSetup(NR), RRCReconfiguration(NR), RRCConnectionReconfiguration(LTE for NR Addition). One example of creating the table is shown below. Basically it has a structure and steps as follows. 0, // these are the pucch-ResourceId defined in resourceToAddModList. resourceToAddModList : Lists for adding PUCCH resources applicable for the UL BWP and serving cell in which the PUCCH-Config is defined. The resources defined herein are referred to from other parts of the configuration to determine which resource the UE shall use for which report. additionalDMRS : Enabling 2 DMRS symbols per hop of a PUCCH Format 3 or 4 if both hops are more than X symbols when FH is enabled (X=4). Enabling 4 DMRS sybmols for a PUCCH Format 3 or 4 with more than 2X+1 symbols when FH is disabled (X=4). 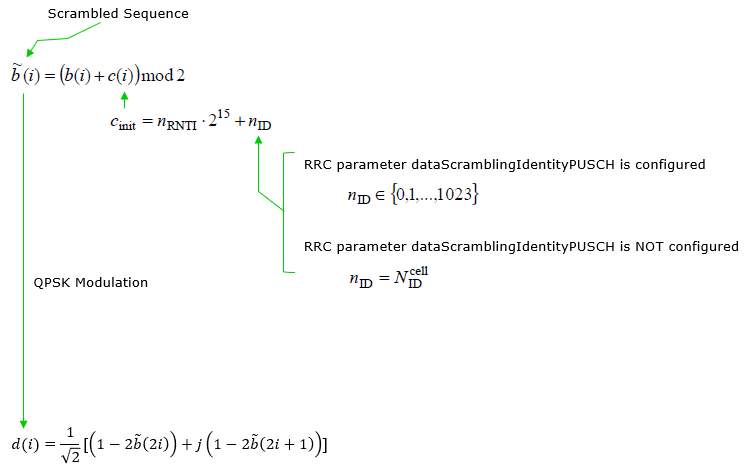 Corresponds to L1 parameter 'PUCCH-F3-F4-additional-DMRS'. The field is not applicable for format 1 and 2.
maxCodeRate : Max coding rate to determine how to feedback UCI on PUCCH for format 2, 3 or 4. Corresponds to L1 parameter 'PUCCH-F2-maximum-coderate', 'PUCCH-F3-maximum-coderate' and 'PUCCH-F4-maximum-coderate' . The field is not applicable for format 1.
nrofSlots : Number of slots with the same PUCCH F1, F3 or F4. When the field is absent the UE applies the value n1. 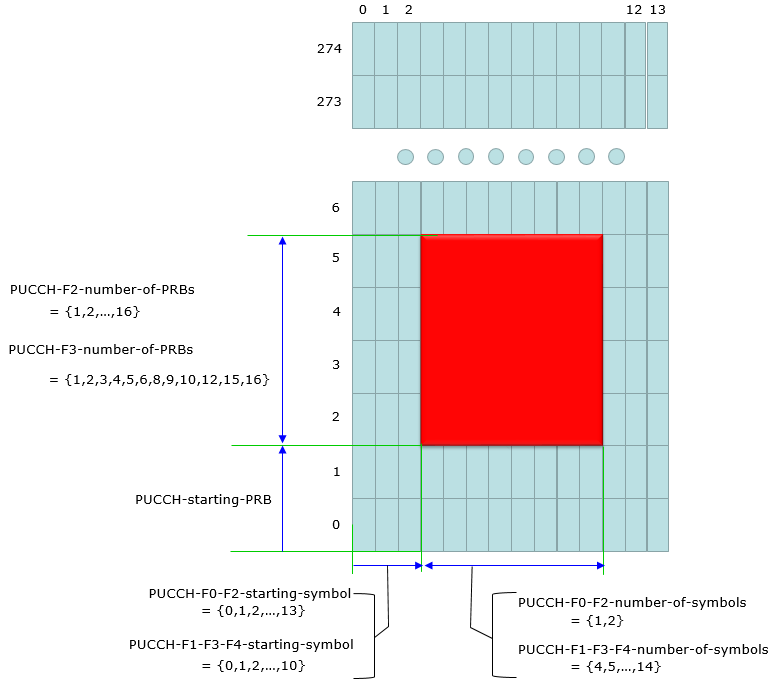 Corresponds to L1 parameter 'PUCCH-F1-number-of-slots', 'PUCCH-F3-number-of-slots' and 'PUCCH-F4-number-of-slots'. 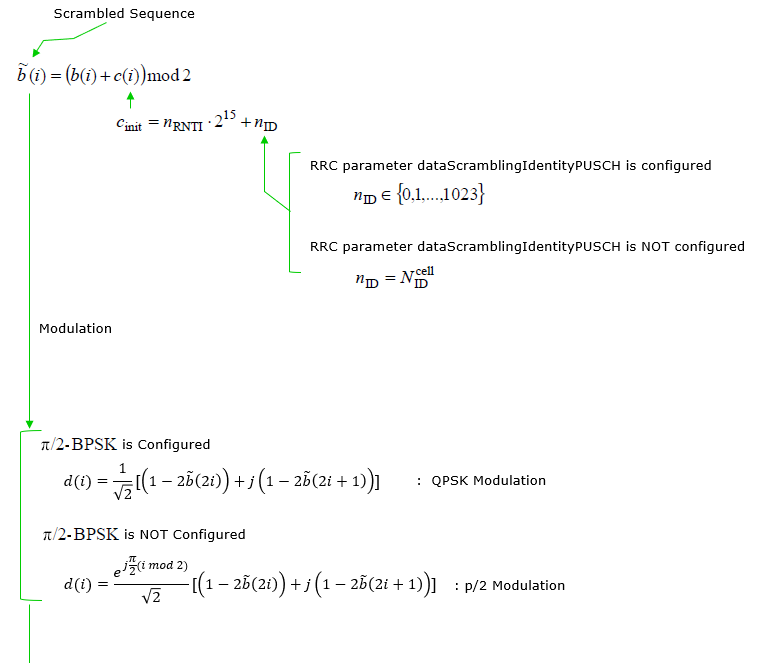 The field is not applicable for format 2.
pi2PBSK : Enabling pi/2 BPSK for UCI symbols instead of QPSK for PUCCH. Corresponds to L1 parameter 'PUCCH-PF3-PF4-pi/2PBSK'. The field is not applicable for format 1 and 2.
simultaneousHARQ-ACK-CSI : Enabling simultaneous transmission of CSI and HARQ-ACK feedback with or without SR with PUCCH Format 2, 3 or 4. Corresponds to L1 parameter 'PUCCH-F2-Simultaneous-HARQ-ACK-CSI', 'PUCCH-F3-Simultaneous-HARQ-ACK-CSI' and 'PUCCH-F4-Simultaneous-HARQ-ACK-CSI'. When the field is absent the UE applies the value OFF. The field is not applicable for format 1.